This Rollover DigiPro G-MAX 40V 19 in. Cordless Lawn Mower allows you to work in your yard with gas performance power without the gas. The DigiPro brushless motor ensures your mower is running at the highest efficiency, offering longer run time and longer motor life. Featuring a durable steel 19 in. deck, a 7-position single lever height adjustment and collapsible handles, this mower is ideal for small to medium size yards. 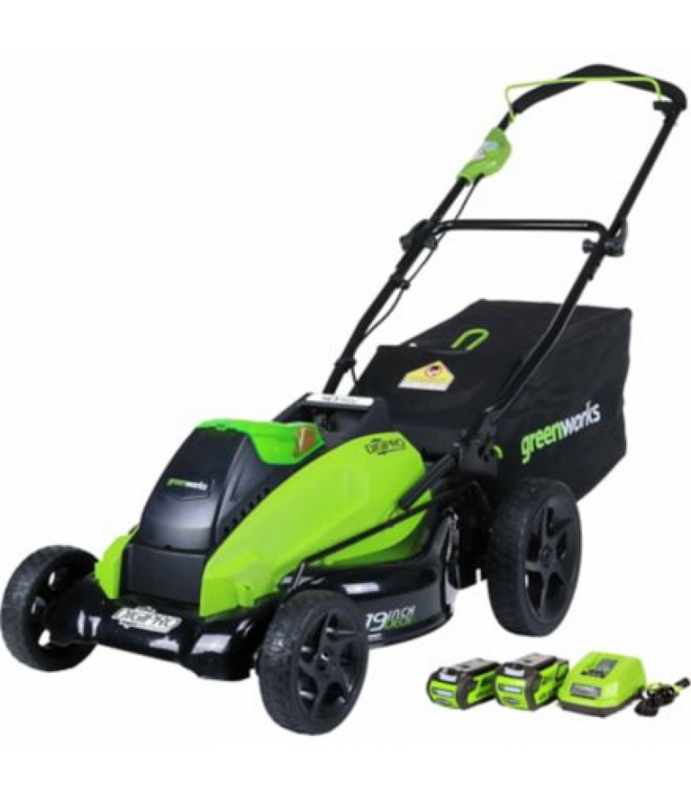 Compatible with Green Works G-MAX 40V Battery, you can easily switch from mowing to trimming and pruning all with one battery platform. Models include an option with battery, 2500502 and model without battery, 2501302. Compatible battery and charger models include, 29462, 29472 and 29482. Not compatible with previous 40V batteries, models 29302, 29282 and 29292. Compatible replacement mower blade model 29373.